Hey, Look! Captain America’s stunt double! No, that fat necked guy dressed as Captain America isn’t Chris Evans, but rather his stunt double dressed up in Captain America’s finest going after a couple of Hydra soldiers. While it isn’t the most flattering image of the hero and the upcoming film, it does gives us a better feel for what the costume is going to look like in the wild. I would like to point out that the suit is a stuntman’s suit and therefore not very representative of the final product. Especially because the actual suit would also look different because of camera, lighting and additional touch-ups. That being said, retro vehicles, pulp feel, HYDRA, The Raiders stunt dude is working on the movie. Anybody else hope this will turn out more Indiana Jones and less Saving Private Ryan? You can do that when you go to Cairo in Superhero City on Facebook. Maybe a nice mix of the beaches of Normandy scenes and some good Indy kind of scenes with decent character development and bad-assery. whoa…editing nightmare, this will be. Sparked my interest though! This is exactly what I needed to see. Cap on cycle. Shield on back. “Wings” you haters…”WINGS”!! Can’t wait. ‘Nuff said. Love the wings!!! Even if they are painted on. It’s not Cap without ’em. I, for one, am definitely interested. I was glad when it was announced that Cap’s first movie foray was going to be in WWII. While I’m not a Steve Rogers fanboy, I’ll definitely be checking this one out. I still feel that the costume looks to modern, what was wrong with the WW2 Ultimate Cap Costume? This looks like it stepped out of the 00’s. I hope when I see the movie it’s explained via Howard Stark designing it, or something to that effect. It looks like the shirt/vest portion of the stunt costume is probably “air brushed” to give it the look of Evan’s on-screen uniform but probably has a ton of padding and kelvar under it in that shot. However, I do like the overall effect with the exception of the “shoulder pads”. 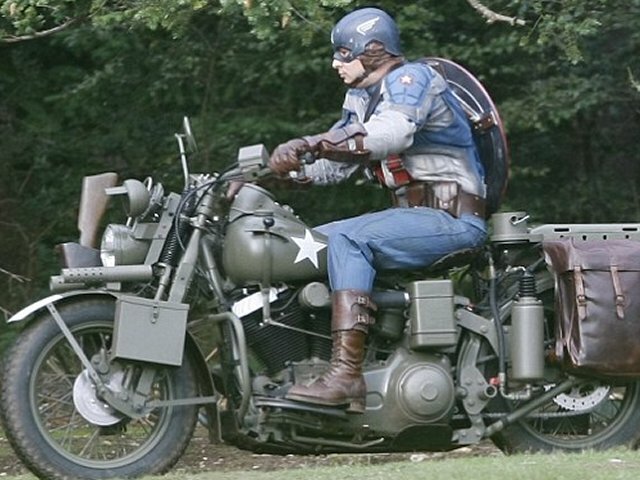 I would, however, LOVE to get my hands on that old 40’s vintage-style army motorcycle!! I bet it rides like a bear with a harness but dang those things were cool! For just a stuntman’s costume (built for movement and such, not for looks) it still looks pretty good. And I don’t know what Larry King is talking about, it looks WAY more like the Ultimates WW2 costume than it does the original. It definitely has that Joe JOhnston/Rocketeer look, which has me WAY excited.